This time it was pulao in mind when I picked a pack of channa(chickpea) at the grocery store :) Hmmmm frankly speaking, its a little time consuming process to make this pulao. But I bet you would not regret the time spent. Trust me, it tastes simply fantastic. In a pan, take a tsp of oil and fry red chillies, cumin seeds, garlic and onion for few mins. Allow it to cool down and then grind it along with coconut and keep it aside. Soak channa in water for 10 hours and then pressure cook it. Blanch tomatoes in hot water for few mins and remove the skin and seeds. Grind it into a smooth paste. Strain and keep it aside. Grate coconut and grind it along with enough water and strain two extracts of coconut milk. Peel garlic and chop them finely. Soak rice in water for 10 mins and then drain it completely. Heat a tsp of ghee in a pan and fry the rice for few mins till all the moisture is absorbed. I'm happy to send this to the "Legume Love Affair" event conducted by Divya of Dil Se which was started on the blog "Well seasoned cook". 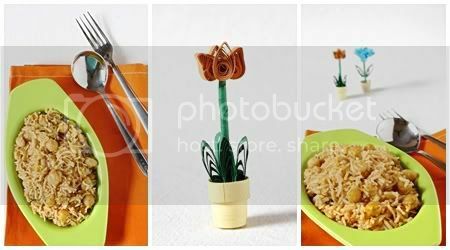 bookmarking it da ... kutty quilling inga vandhuttanae cuteaa ... super ..
Wow, that looks lovely Nithya! And what a great idea you just gave me for dinner since my fridge is empty and rainy day won't let me get out to buy grocery so this would be perfect for a nice hearty meal! my fav too ..looking soo yummy! My favourite channa in anything goes directly to my favourite list too, needless to say am drooling rite now here over that droolworthy channa pulao, makes me hungry Nithya..
my mum makes them and we used to binge on it just like that, love ur 3rd click! I can see your refection in that spoon :) Wholesome meal. Thanks for sending this for MLLA! 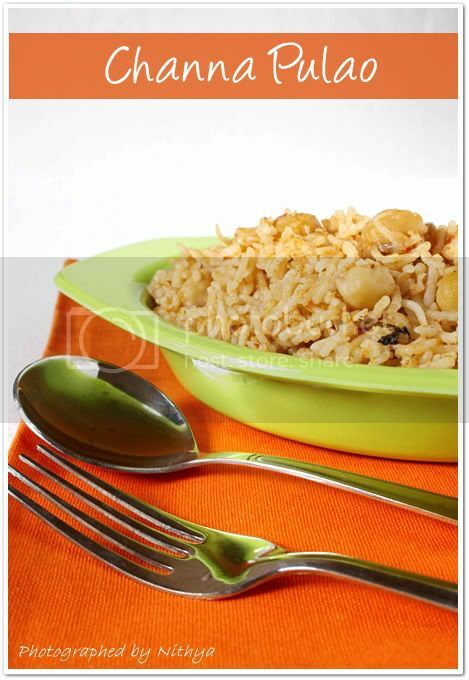 Chana Pulao looks super fabulous. Loved the click. channa puloa is my daughter's fav. sometimes i add coconut milk and sometimes i add coconut while grinding. lovely presentation. 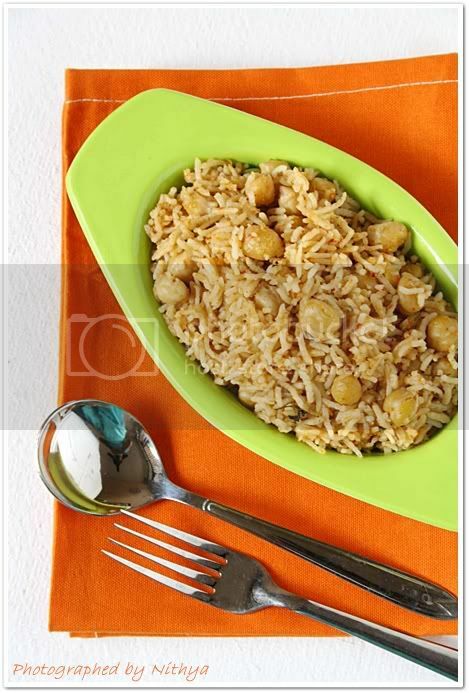 Wonderful healthy rice and as u said I too love channa in any form.. Your pictures makes the rice more beautiful nithi and the quiling looks so cute. Even I love kabuli chana...pulao looks really appetizing n yummy..
Chana paula looks absolutly delightful..healthy and tasty. 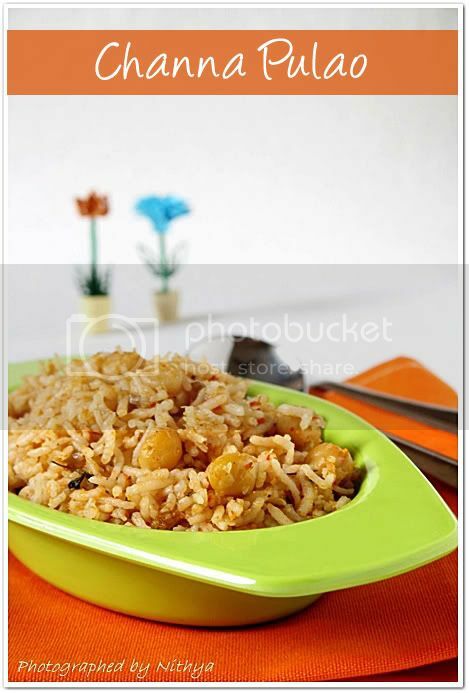 YOu re welcome to my space too..
Love this rice... looks yummy Nithya. 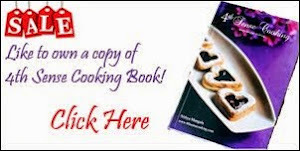 I do not think this is a very tiresome recipe. It is interesting to prepare and I am sure it would be delicious too. I will try this and let you know the feedback. I also love the white chana... the bigger one called “Kabuli Chana”. My mother used to prepare it with Appam. During weekends, we used to bath early to have it because her rule was to have food only after bath and Morning Prayer. Looking forward to creative recipes and pictures.